Hello lovelies! I can’t begin to tell you how excited I am that you have made it here to the first blog in our series for the dreamers. Before we start, I just want to let you in on what inspired me to begin this incredible series. For many months, I’ve been trying to figure out what my main goal and purpose is for That Christian Girl. What is it that I want to accomplish? What is it that GOD wants to do through this incredible community? What do I enjoy in life? What can I see myself doing that is fulfilling? Does this line up with the purpose God has spoken into my life in years past? As I began to ask myself these questions, the answers became clearer. I love to uplift and encourage others. I find fulfillment in inspiring people to better themselves physically, spiritually, and mentally. Seeing people grow personally and spiritually brings me true joy. 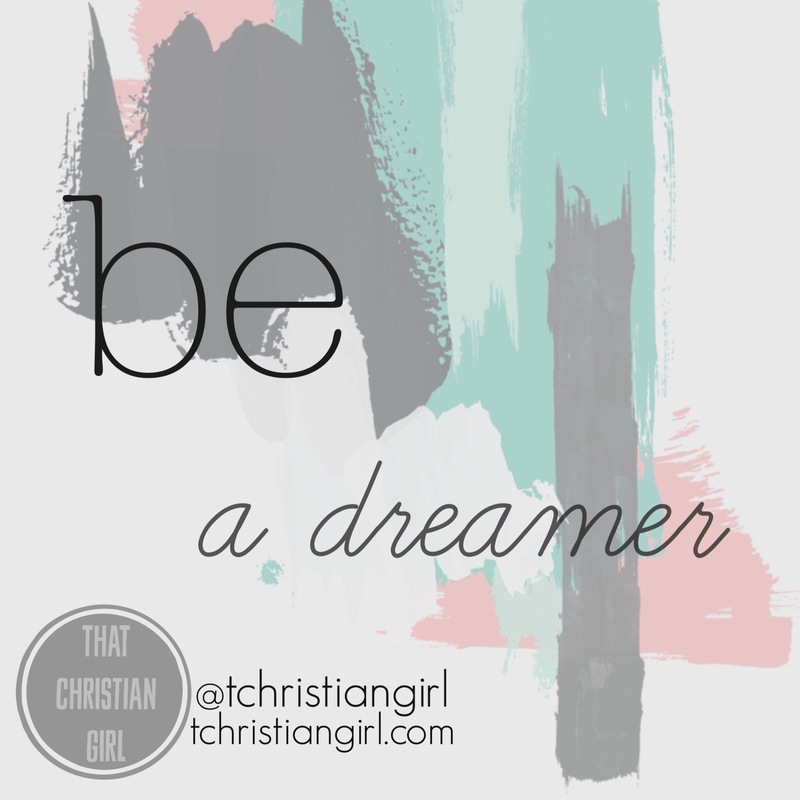 My dream… my dream for That Christian Girl is to do just that. To uplift you. To help you grow. To assist you in making your dreams and God-given purpose in life a reality. To laugh with you in the good times. To be that shoulder to cry on in the bad. To be a sister and friend. And most importantly… to help draw you closer to Christ. Today’s blog is so simple and yet… it’s so important. If you have a passion inside but aren’t sure how to use it, I encourage you today to be a dreamer. Even if it seems crazy, even if people say it’ll never happen, dream anyway. Start a dream journal. You need a place where you can keep your thoughts and ideas organized. I just bought this journal at TJ Maxx the this week. Target, Barnes and Noble, and Marshalls are some other great places to buy journals. Or if you have a free journal at home or want to create your own, that’s great, too! Use what you’ve got and make it as fun as you want!! Write down that one thing that’s been burning inside that you’ve been wanting to do for so long, but never had the time, courage, or motivation to do so. List! List! List! List all the ways you can make this dream become a reality. Whether it’s to post a blog, start a facebook group or page. Circle 3 of those things that you can start doing TODAY. No matter what your dream, our goal and mission is basically the same – to create a better world around us. I know that this is just the beginning of an incredible journey together. And I want to be with you every step of the way. So here’s the deal… throughout this series, I plan on being your cheerleader and biggest fan. But I’m also going to be your motivator throughout each week. I’m going to start posting videos on Instagram each week that go with our Be. Stay. Go. series. They will be challenges are you will be expected to ‘check in’ by using the hashtag #TCGdreamteam. To be sure that you get updates on the latest content, be sure to get connected! Become a part of our Facebook family.